Which came first, the chicken or the egg? Hmm. I don't know. That's s good question! I mean, a chicken comes from an egg. Yet an egg is produced by a chicken. Well if you know the truth, it's not really a mystery at all. God created a chicken, and then the chicken produced the egg. Another query: Are you happy because you are in love or are you in love because you're happy? My wife Jennifer and I recently crossed paths with a young lady from our past. I have known this woman, who is my age, for 20 years. She is still unmarried. I know for a fact she has a burning desire to be wed but has yet to find that special someone. Anyhow, when Jen and I first became engaged to be married in February of 1999, we happened to be sitting at the same table in a restaurant with this certain young lady. When a male friend of hers asked me "How are ya, Brad? ", I replied, as always, "I'm great!!". Upon hearing this, the young lady almost exasperatingly stated "Of course he's doing great. He's getting married soon." So the insinuation seemed to be that the key to true happiness is finding that love of your life. While I concur that my wife has added much to my life, I reject the notion that one is doomed to a life of unhappiness until the arrival of a betrothed. Because I accepted Jesus Christ as my personal savior, He was made Lord of my life. I sought His righteousness. I had peace that I would meet my maker in Heaven someday because I accepted Salvation. Wouldn't this also make one happy? Knowing that any trials and tribulations you suffer can all be cast away? You don't have to bear your burdens alone. That itself makes me ecstatic! The ultimate sacrifice the Lord made was giving His only Son so we could spend eternity in Heaven. That's a debt we can never repay. How can one not pledge eternal love to someone who makes such a sacrifice for our well being? I love God, who is the heart of my contentment! As a result, I was blessed with Jennifer (a/k/a my "good thing!"). In short, I'm was (and still am) in love because I'm happy! I don't know the statistics, but I would say very few people in life ever get an opportunity to fulfill a childhood dream. As a kid, I rebuffed all suggestions that kids want to grow up to be an athlete, policeman, fireman, etc. Since I was roughly 9-years old, all I ever wanted to do is.....TALK. As in broadcasting! I was the kid who did mock baseball and football broadcasts on a cassette tape recorder (revolutionary in 1978). I would turn down the sound on the TV and do my own interpretation of an athletic event. As time marched on, I broadened my horizons to the political and social issues of our time. I always thought I was a Democrat until 1992 when I heard Conservative icon Rush Limbaugh for the first time. I realized what was inside me, and finally someone helped me find the words to convey it! Since my Dad and paternal Grandmother were (and still are) staunch liberal Democrats, I had to constantly go over in my mind the vital facts that make the Conservative ideals superior to Liberalism. Hence, I began to verbalize those thoughts. Until I became more adept at articulating my arguments to others, I basically talked to myself. That is precisely why I felt talk radio was the venue for me. Then how come I wound up with an Accounting career? A little apprehensive about taking chances, I guess. Why not get an Accounting degree? Everyone could use a good Accountant, right? I mean, how does one normally break into the broadcasting business? Through broadcasting school? Knowing someone in the business? Yes, I rationalized every conceivable way as to why I wasn't more aggressive in pursuing broadcasting. My dream shot came through a venue entitled "The Next Big Thing". 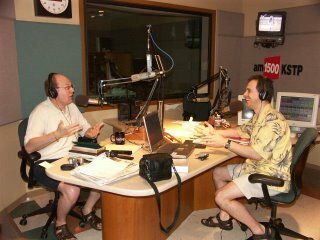 Beginning in March 2005, Twin Cities' station AM 1500 KSTP offered complete amateurs an opportunity to host a two-hour talk radio show. 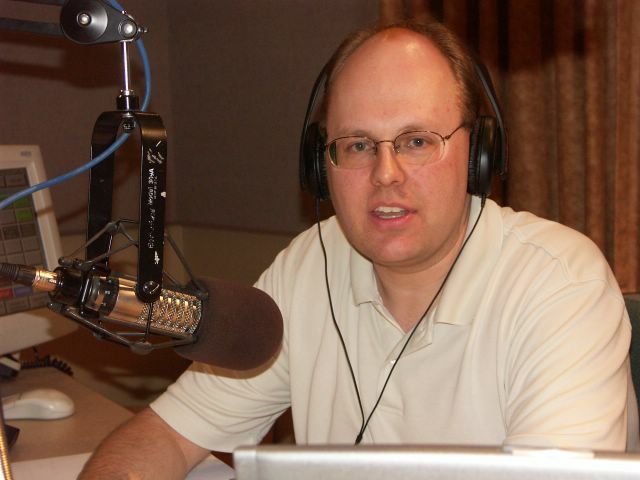 KSTP requires one to send in an audition of a mock talk show. If it shows promise, you get the 2-4 PM Sunday slot one time. My good friend, Greg Bittner, and I sent in a audition tape which did indeed show promise. We got our opportunity on June 19 to "show our stuff". While our respective families thought we were great (no bias there), I am still awaiting an independent critique from local blogger Speed Gibson. Regardless of the feedback, I received an opportunity to do something I have always wanted to do. Even had it been an abysmal failure, I gave it a try. To quote legendary NBA player Michael Jordan, "I can't accept not trying." In the first meeting between the Cincinnati Reds and Boston Red Sox franchises since the classic 1975 World Series, I saw a rather curious sight on Monday. The Reds were starting a left-handed pitcher by the name of Eric Milton. That caught my interest since my favorite Major League Baseball club, the Minnesota Twins, once had a southpaw by the name of Eric Milton. "Milty", as he was affectionately called, was a member of the Twins from 1998 through 2003. He even gave us Twins fans a rare thrill in the late 90s with his no-hitter against the Anaheim Angels (now referred to as "The Los Angeles Angels of Anaheim". An aside: Since the Spanish phrase "Los Angeles" translates to "The Angels" in English, I guess that makes the club "The Angels Angels of Anaheim."). When witnessing the Monday evening debacle that was the Reds' 10-3 loss to the Sox, I figured that couldn't be the Eric Milton that played for our Twins. The same Eric Milton who won 41 games from 2000-2002? The same Eric Milton who was traded by the Twins to the Philadelphia Phillies for key players such as Carlos Silva and Nick Punto? The same Eric Milton who, when traded, prompted All-Star CF Torii Hunter to question the teams' commitment to winning? Much to my surprise, it was indeed that Eric Milton. The same Eric Milton who is now 3-8 with a 7.97 ERA. The same Eric Milton who has allowed seven or more earned runs in three of his last four starts. The same Eric Milton who thus far this season has allowed a whopping 22 home runs in just over 75 innings pitched (roughly 2.5 per nine innings). With those kind of beatings suffered lately? Say "Uncle", Milty.